Food gives us energy, brings people together, and makes us feel good. The first bite of something delicious is one of life’s great joys. But this feel-good factor can also have us eating for many reasons other than true hunger. So, what are some the reasons why we eat? Can’t go to the movies without hitting the candy bar? What about walking past a platter at a party? We often eat not because we’re hungry, but because food is there. Another problem is right in front of us – our portions. You may be surprised to discover what a recommended portion size actually looks like. Think 3.5oz of chicken, half a potato, or just a quarter of an avocado. Most of us are loading way too much onto our plates. Studies have also found that the bigger your plate the more you’ll eat. It’s an evolutionary hangover from the days when food was scarce. Use a smaller bowl or plate so your meal looks bigger. Stand with your back to the food at a party. Hands up if you take your frustrations out on food? Prolonged high levels of the stress hormone, cortisol, can increase our appetite and make us crave carbs, sweets and fats. Argh! Being more mindful when we’re eating can helps us to avoid mindless snacking. This means sitting at the table for meals and snacks and eating slowly. You can also take a break, a few deep breaths and have a glass of water. This will help the feeling of stress and ‘hunger’ to pass. It’s tempting to fill time with food. Instead, follow that old childhood advice and go outside, phone a friend, read a book – whatever you like! Busy hands won’t be as tempted to grab snacks. Another tip is to avoid eating in front of the TV. If your mind associates the two activities, you could start to feel hungry every time you relax in front of the telly. We’ve probably all used food as therapy at some point. 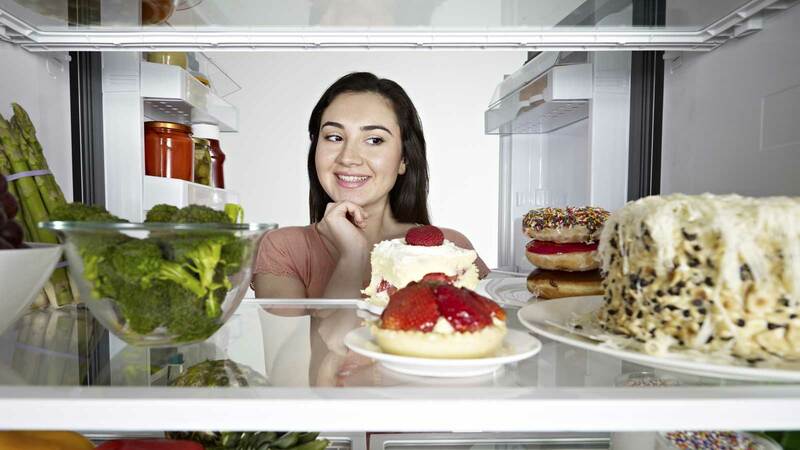 When we’re feeling rubbish, it’s tempting to turn to junk food to satisfy our emotional needs. And there’s no harm in the occasional treat. However, if you are going to comfort eat, try to enjoy healthier snacks, like fruit and nuts, knowing that you’re satisfying a momentary craving and being good to your body too. If you’re worried about emotional eating, it’s important to seek the advice of a health professional. Are we all having dessert? It’s easy to give in to social pressure to order a dessert even if you’d rather not. A good idea is to order a herbal tea to quench your thirst for something sweet. But if you can’t resist, split a dessert with someone and share the calories too. Is hunger in your DNA? Watching what we eat isn’t enough. We need to be mindful of why we eat. There are plenty of emotional reasons for eating, but did you know that your genes could also be behind your insatiable appetite? A myDNA DNA Weight Management test kit will tell you if you have one of the gene variants that increase appetite and cravings for sugary and fatty foods. Armed with that knowledge, you can take back control of your diet and understand why you eat in a powerful new way. This article does not provide medical or dietary advice – it only seeks to provide opinions. The information, including but not limited to, text, graphics, images and other material, contained in this article are for educational purposes only. The content is not intended in any way as a substitute for professional medical advice, diagnosis or treatment. Always seek the advice of your doctor or other qualified health care provider with any questions you may have regarding a medical condition or treatment and before undertaking a new health care regimen, and never disregard professional medical advice or delay in seeking it because of this, or any other blog article on our website.